Polce is a secluded beach offering a picturesque view and a peaceful atmosphere. The rocky beach is home to a couple of fascinating pools and a restaurant serving delicious delicacies. The beach is well maintained with clear water, sun beds, rocks, pebbles, sand and a few adventures. Polce is a secluded beach offering a picturesque view and a peaceful atmosphere. The rocky beach is home to a couple of fascinating pools and a restaurant serving delicious delicacies. The beach is well maintained with clear water, sun beds, rocks, pebbles, sand and a few adventures. For people who wish to get away from the other crowded beaches of Budva, this is an ideal option that offers comfort as well as solace. Due to the pebbles that graciously lie about it, this beach has become of special interest for family and kids to visit it. The water is crystal clear and you will also find little pools set into the sunbathing terraces. 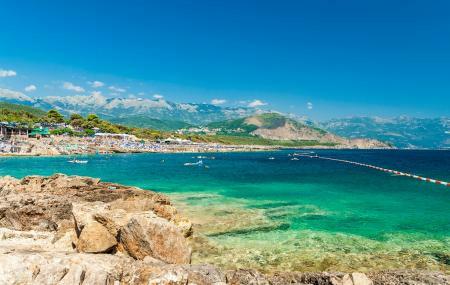 This beach is also famous for its beach resort, Ploce that offers ultimate entertainment to the visitors. Parking is easily available and free of cost. The restaurant staff is friendly. How popular is Ploce Beach? People normally club together Trg Izmedju Crkava and Jaz Beach while planning their visit to Ploce Beach. We had a lot of fun here,the music was ecxellent,foam party,everybody dancing all around us...It reminded me of Ibiza!!! !Dancing in the pool with water up to our knees,drinking Mojito!! !What amazes me it's that it's always fun here!!!! !The place definitely has a great vibe!!!! !I'l go back next summer for sure!!!! Very nice and organized beach. Parking is free of charge which is supprising for the Montenegro. You need to rent place and to pay it and also you cant bring your own food, just water. Why 4 not 5 stars, becaouse you pay for the showers, for me it is unexeptable and just stupid think that spoiled my dayend on this beach. TERRIBLE PLACE! Don't go there! We went to Ploce Beach with friends and one of our bags containing cash, phone, car keys... was stolen. The Beach management wasnt cooperative at all, and when we asked to see the security footage they got into a fight and beated some guys in our group! We are convinced that the bag was stolen by someone from the crew and the management is part of this big SCAM! Avoid under all circumstances, it was our worst nightmare in Montenegro!